Exotic in look yet inexpensive to buy, sustainably harvested bamboo flooring continues to grow in popularity as an alternative to hardwoods. If you’re looking to install new hardwood floors, why not consider today’s eco-friendly alternative, bamboo? Considered a renewable resource because it grows so quickly, a freshly harvested bamboo plant only takes about seven years to reach maturity again. Of course, hardwood trees like oak, ash, and maple regenerate also, but it takes them considerably longer, at least 40 or 50 years. There’s no denying that bamboo flooring can look as beautiful as hardwood. It can even offer a comparable level of durability. But its looks and longevity depend on the variety chosen. On the one hand, there’s natural bamboo, light in color (almost blonde), which boasts twice the stability of red oak (America’s most popular flooring). On the other hand, there’s carbonized bamboo, a darker and softer, less resilient material. Though comparatively few color variations are to be found in bamboo, a range of design options are available, from edge-grain planks to exotic, striped “tiger” designs. Note that solid bamboo is stronger than engineered, which consists of multiple layers. If intent on the latter, choose a product featuring a 1/4-inch-thick top layer for best results. Coming in between $5 and $8 per square foot (before installation), bamboo flooring is on par with, or less costly, than traditional hardwoods. If you’re handy, you can install bamboo flooring by nailing or gluing it directly onto the subfloor. If you opt to have a professional install the floor, expect to pay between $3 and $5.50 per square foot. • High-quality bamboo wears as well and lasts as long as traditional hardwood. • Bamboo flooring lends a clean, modern appearance to any room. • Bamboo is more sustainable than traditional hardwoods. • You can easily clean bamboo flooring with a mop and mild soap; no special treatments are required. • Inexpensive bamboo may be prone to dents and scratches. 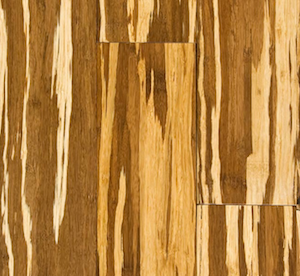 • Bamboo flooring from China may contain high levels of urea formaldehyde, a toxic chemical; make sure the flooring you buy is certified by the Forest Stewardship Council (FSC). • The contemporary look of bamboo may not fit in with a vintage- or antique-inspired home decor scheme.